Over many years, numerous artists made, and continue to make, the journey to the west of Ireland to paint the magical blue light on the Twelve Bens (sometimes called the Twelve Pins or, in Irish, Na Beanna Beola); a mountain range that forms the backdrop to the wild and lake-strewn Connemara countryside. Most eminent of these painters was undoubtedly Paul Henry (1876–1858), whose picture, A Connemara Village, was recently voted in the top ten of the most popular paintings in Ireland. A Connemara Village, executed in 1933-34, was one of Henry’s many depictions of the area, characterised by both his bold handling of Atlantic skies and portrayal of the blue haze that envelops the mountains. 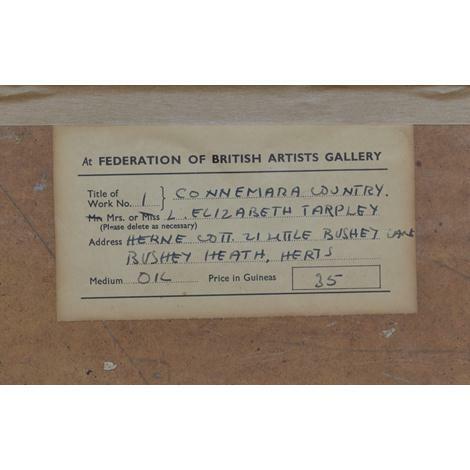 So distinctive is the blue cast that a number of his paintings refer to it in their titles, including, Lake and Blue Mountains (c.1935) and The Blue Hills of Connemara (1933). 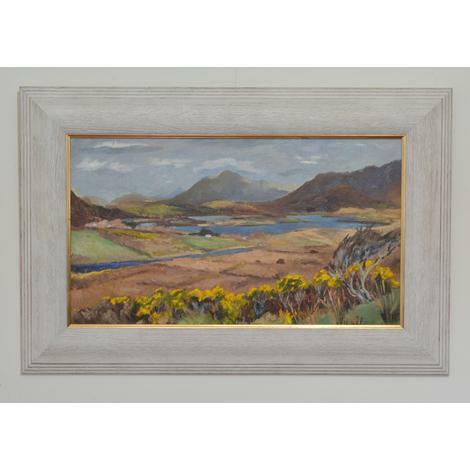 Tarpley did not emphasise dramatic skies, as Henry did, but she is - in our opinion - as successful as he in capturing the elusive light on the Twelve Bens in her painting, Connemara Country. Here, her use of a limited and harmonious palette of blues and violets in the sky, mountains and lakes is highlighted by her dramatic application of the complementary sharp, golden yellow of the gorse in the foreground. We have not been able to identify exactly the profile of the peaks shown. Tarpley's treatment of colour and light, however, evokes precisely the character of Galway’s western reaches; it could be nowhere else.